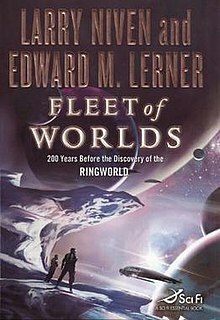 Fleet of Worlds is a science fiction novel by American writers Larry Niven and Edward M. Lerner, part of Niven's Known Space series. The Fleet of Worlds (sub)series, consisting of this book and its four sequels, is named for its opening book. The novel, co-written by Niven and Edward M. Lerner, was released in 2007 and nominated for a Prometheus Award. It is set shortly after the events of the short story "At the Core". The novel concerns the liberation of New Terra from the Concordance of the Pierson's Puppeteers. It also introduces a new intelligent species to Known Space, the Gw'oth. Fate of Worlds: Return from the Ringworld (2012). The first four novels are prequels to Ringworld; the last one is a sequel. ^ "Summary Bibliography: Larry Niven". www.isfdb.org. This page was last edited on 9 March 2019, at 08:13 (UTC).